Will Santa come early this Christmas? Get into the Christmas spirit with the Happy Holidays pokies game. This 5 x 3 reel, 243 ways to win slot is elegantly crafted with festive symbols including Santa, Snowman, Stocking, Presents, Christmas Lunch, gingerbread house and turkey symbols. With merry background music, visually stunning graphics and high paying bonuses, this online pokies game is playable as a free demo, or alternatively with real money at any of our reviewed casinos for Bitcoins. Christmas is all about giving and this game delivers with lucrative bonuses designed to give back to players. The scatter symbol is depicted by the gold Christmas tree decoration and when you land 3, 4 or 5 you win 10 free spins at 1024 ways. During free spins the snowman symbol can transform into other high paying symbols providing the maximum possible win. 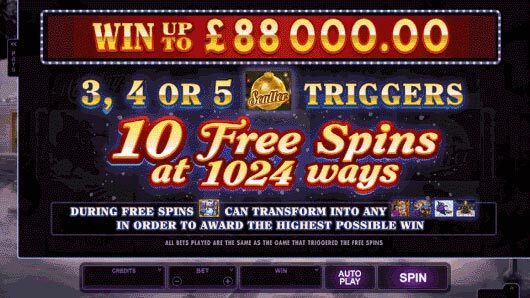 Unfortunately the free spins cannot be re triggered. The second feature is the Frosty bonus feature which is won at random on any non winning spin. This awards a cash prize and if you see a scatter on screen during this bonus you win additional free spins. Playing the Happy Holidays pokies is just as easy as the Aristocrat slots found in Bitcoin, it is so easy to adjust our bet size and cash out your winnings at the click of a button. All pays are left to right, the scatter symbol pays in any position and the WILD replaces all other symbols except the scatter. The Happy Holidays slot will guarantee a jolly good time this Christmas with a minimum bet size of 30 cents and jackpot reaching up to 100,000 coins.